Serena Williams started the first game of the match with a victory. However, in the end, it grew into an emotional roller coaster with verbal attacks and incivility aimed at the match umpire. Ultimately, she would go on to lose the 2018 U.S. Open women’s tennis finals. Much of the spillover from her toxic rant has led to a subsequent emotional roller coaster of fiery online exchanges, accusations of sexism, and anger-baiting media coverage. Let’s give ourselves permission to break away from our emotionally charged opinions and start with the facts. It’s important to remind ourselves that facts don’t care about our feelings. Fact 1 is that Patrick Mouratoglou coached Serena Williams from the stands. He clearly admitted to such in a direct interview with ESPN. Fact 2 is that coaching from the stands during a match is an action that when cited, results in a warning or penalty given to the player. Whether the player sees the coaching or interacts back with the coach is of no consequence. Mouratoglou stated that everyone coaches (or is coached) during a match. This may well be true, but it doesn’t create an allowance for making it okay. Most drivers break the speed limit at some point in their lives – and if caught, they can’t excuse it by citing speeding as a common behavior of many drivers. When Serena chose to enter into a verbal exchange with umpire Carlos Ramos, she took action, whether consciously or unconsciously to shift the narrative away from the action of her coach and onto herself as a woman protecting her honor. Let’s focus on the carefully bouncing ball here. “I don’t cheat…I didn’t get coaching” were the words from Serena. She framed the exchange around the presumption that the umpire was accusing, blaming and disrespecting what she and her game stood for. Remember that whether she knew it or not, she did get coaching – and Ramos saw it. Instead, she chose to play the role of victim and create a perspective that the umpire was an aggressor. Serena knew a majority of people in the stands were ‘for her’. A built-in support system that could be, and I would argue was emotionally manipulated. She would also add that she was standing up for the rights of women…and setting an example for her daughter. Though a terrific champion and inspiration to so many, it was clearly Serena who stepped out of bounds when she blamed, shamed, and name-called the umpire. She attacked HIS lack of honesty and integrity – [see definitions of the words “liar” and “thief”]. By actually doing to him what she accused him of doing to her, wasn’t he entitled to an apology? Why does he deserve less? Serena made another key mistake of engagement by speaking too much and listening too little. This led to a second faulty presumption that the umpire had reversed his given warning for coaching – which he had not. I actually do see Serena as a victim – but only from a clear failure to control her own poor behavior. She failed to use emotional intelligence to better control her escalating disrespect, finger pointing, blaming, shaming, and name-calling. Remember – the umpire did not take a game away from her for the coaching – this was just a warning. She subsequently smashed her racket and then verbally assaulted the umpire. Her own actions, like a runaway train of rage, ultimately became her undoing. Such actions often lead to poor habits and patterns of engagement. 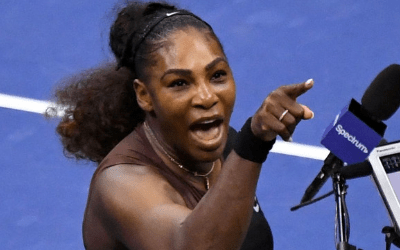 We have seen this from Serena and other athletes over and over…as well as with those we are connected to in our home, work, community, and online environments. Welcome to our next major societal challenge — combating toxic incivility. Most especially during stressful times or when we have differences of opinion. As for Ramos, he’s been known to be selective on his calls. From Djokovic and Nadal to Andy Murray and Venus Williams. Ramos also is one of the game’s highly regarded umpires, having called matches at all the Grand Slams in his 27-year career. If sexism truly exists within the officiating of the USTA, then it should be fully validated and dealt with appropriately. I only ask that the analysis for its proof or disproof not be undertaken in a way to selectively fit any type of cognitive bias, by either side to this accusation. Serena gained big respect from me for employing genuine empathy during the trophy ceremony. The next time she finds herself faced with a triggering event, I hope to see her ‘Walking The Ridge‘ (employing more civility). Calculated restraint, better control of emotions, and improved awareness of the situation will better serve her in the future. It will also be an inspiration to millions of her followers that we need to recognize each engagement and conversation, not necessarily to agree to compromise our views, but as an opportunity to listen, learn, and grow. We can and should have differences of opinion, but they should be catalysts toward fostering and improving a move inclusive and civil society. What I think you’re missing when you say Serena showed “genuine empathy” during the trophy ceremony, (if you watched this match), is that she staged the whole disrespectful drama to get the crown riled up and take away the joyful celebration of her opponent winning the US Open. It was like a sinister plot, her tantrum and atrocious behavior carrying on that long, that should convince one to see her empathy was probably not “genuine” at all, as you stated. She knew she was losing the match badly and her way to get back at her opponent was to create a behavioral outburst as a ruse using the NY crowd. There seems no other reason to carry on with that level of disrespectful behavior over such a long period of time, all starting over 1 measly point! That’s nothing for a champion to overcome…but she knew Osaka was playing far better this match…than she was. Think about this…Serena has won over twenty major tennis championships which she joyfully celebrated and was applauded loud by the crown…each and every time! Naomi was winning her very 1st championship and at the trophy ceremony, the crowd was just booing. Think of how crushed she must have felt in her heart during that moment where she deserved to be ecstatic? The cause of that was all because of Serena Williams. She chose not to get over her tantrum but used it to project blame on the umpire. She slandered him, belittled him, and threatened him and all because she was losing and could not do so with grace and civility. Oh yes, Serena knew what she was doing to her opponent all along and if you watch the whole match you’ll see after she got behind, that she chose to display disrespectful and unprincipled behavior towards the umpire and Naomi, that can only be described as the exact opposite of what most would define as civil conduct towards a fellow human being. That’s how I saw it unfold when watching.